Another winter is in the books, and it’s beginning to look like spring is in the cards for us, after all! That also means it’s time to turn your attention to the upcoming season for everyone’s favourite summer concert band! Our intrepid librarian has advised me that there are still some binders that have not been returned from last summer. He will be revising the binder this month in preparation for the new season. If you still have a Millennium binder in your possession, please contact info@mbmillenniumband.com to make arrangements to return it as soon as possible. May 18 – Saturday – 10 am – 12 pm – Legion Branch #252 – 426 Osborne St (upstairs) – if possible, please try to arrive a wee bit early so that we can get music assigned and begin the fun as close to 10:00 as possible! The following times are performance times for advance planning purposes. (Call time is usually 30 minutes earlier). Additional details (including more gigs, which will replace some of the August rehearsals) will be supplied as they are available. I was very happy with the use of our May rehearsals last year, so I will be using our time the same way again this year. That is to say, we’ll be focusing on our more complex music exclusively. I hope to see you all on May 18! This is the time of year when I sit back, sip a (metaphoric) glass of wine, and reflect on the summer that we’ve had as an ensemble. A lot of things went really well this summer! (I can’t think of a one that went poorly). I tried an experiment with our May rehearsals, and focused almost exclusively on the music that I expected would prove challenging for us. From my perspective, this was a resounding success! Not everyone is available on Saturday mornings, but taking this approach enabled those who could make it out to get a head start. I believe this sped the learning process – having someone in your section that’s familiar with a piece makes a big difference! I plan to continue this going forward. To our newer members: Ceud mile failte! (Scottish Gaelic: a hundred thousand welcomes!) I know that for a number of you, the level of music was a challenge, yet you chose to stick it out. First of all, a big hip-hip-hurray! for your courage to stay with us. Secondly, throw in a goodly number of huzzahs for putting in such a tremendous effort to tackle the hard stuff! I am aware that many of you put in hours of practise time on your own to be able to say you had tried your best. Those efforts have not gone unnoticed. It has been an absolute delight to have you with us! I do hope that you’ve had positive experiences, that you felt welcomed into the fold, and that you’ve expanded your contact lists (you never know when something will come up and it’s good to have a list of people to approach!) I also hope that we’ll see you again in the spring! The development of everyone’s personal playing has been inspiring for me to witness. Whether you’re aware of it or not, we all grow through the summer together. The short rehearsal season, the challenging repertoire (I know you can play these – you haven’t yet proven me wrong), my incessant demands and high standards, the challenges (stamina, expression, range, variable attendance, etc), and your commitment to doing your best work all combine into a magical elixir. Every summer, we part stronger as individuals than we were upon convening. You stretch me every summer – to lead you better, to be more helpful, to keep learning myself (so that I can better share what I know). As much as you have all improved, you continually make me better. We start out as a bit of a ragtag assembly, but through the rehearsal process (which is intense), we end up a well-oiled machine. You all give and give and give of yourselves – even when you don’t believe that I know what I’m talking about (I see your skeptical faces). But you choose to trust me anyway, and I can tell (from the happy, smiling, expectant faces) that you know when we’ve nailed a piece. This year, you really exceeded my expectations, and seem to have internalised a lot of the control that I’ve talked about over the past couple of summers. I encourage you not to get lazy as you go back to your regularly scheduled bands and continue to push yourselves – just look at what’s happened in three to four months! These folks have done a tremendous job at keeping the wheels going. They work hard to ensure that our dues remain as low as possible for the summer, that we have suitable rehearsal space, a lovely meal at Victoria Beach, that your music is in good order, that we have opportunities to perform (and while we do have our stand-bys, we also look into new-to-us leads), and any other matters that come up unexpectedly. A lot of what they do isn’t visible, but they are incredibly committed to providing an environment that’s conducive to musical development, enjoyment, and that it’s worry- and stress-free for everyone. And they do an absolutely stellar job of it! I’d like to send a tip of the ole hat to Bruce, who took over the bookings portfolio: what a smashing success our gig scheduling was this year!! Talk about a grand slam!!! (I know Bruce is a Goldeyes fan, so the baseball reference is, I think, especially apropos). The info@mbmillenniumband.com email is monitored (by me) all year long, so you may always reach us there. I would encourage you, if you have any suggestions, questions, comments, music requests, etc, to please not hesitate to reach out. This is, after all, your band – we want to make it as easy as we can for you to have a wonderful experience. Thank you for making this such a tremendous season: for your hard work, for your focus, for caring so much about the music and each other, for the sweat and the spit (there was a lot of both! ), for the laughter and the tears (mine, that is!) Most importantly, thank you for the music – it has been a joy and an honour to work with you every week. And here we are, at the end of the line. But, we’re all in one piece! When: Saturday, September 8 – call time is 7:30 pm. The warm up will start at 7:55 pm, with the baton dropping promptly at 8:00 pm (unless the festivities delay us for some reason). We will be playing outside in one of the rink areas. There will be lighting, but you will also require a stand light!!! (Last year, they cut the lights and started the fireworks early. They may do the same again this year, so let’s be prepared). Also, you will likely need page fasteners (i.e. clothespins) or plexiglass as it may get a little breezy. In the event of inclement weather, we will be moved inside. Let’s all hope for good weather! Please turn in your music after this concert. The librarian requests that your return it to numerical order before handing your binder in! Let’s have a whale of a time, and show Bourkevale what they’ve enabled us to accomplish! We WILL have a sight-reading piece this week, even though it’s a dress rehearsal. Here’s what our programme looks like (as of this writing) – there may be some changes (so keep 76 Trombones, The Blue Orchid Tango, Jazz Chaconne in your mind). Please, if you need to turn in your music, make sure the pieces are back in numerical order. This saves our librarian a lot of time and effort! See you on Monday, then Wednesday! Wow, folks! Just WOW! Our Concordia Village concert last evening goes down in history as a smashing success! I had a tough time extricating myself from the mob that descended upon me! I am inordinately proud of our performance. Yes, there were a couple of small hiccups, but we managed to hold it together very well. People were paying attention, recognised when they were out of sync, and managed to figure out how to fix it. I found that people were trusting my cues a bit more – paying attention if they were unsure of entrances – I’ve always got your back! If I start going into details, I’ll be here all night. Each and every one of you deserves to be highlighted for your work. No word of a lie – every section, every part, had at least one moment of shining glory last night. You all rose to the occasion. I had literal goosebumps throughout Arctic Fire and Hallelujah. The tears threatened – twice. And, if you saw me being mobbed (it was orderly – they lined up! ), then you can understand how important what we do is to our audience. We brought a lot of light and joy last night. I think it was one for the record books! Let’s do that again, shall we? Next on our schedule is our Monday evening concert! (Shaftesbury is only having groups in on Mondays as their new policy, so it was either take a Monday or not play for them). Please do your best to arrive at 6:30 pm so that we have time to do perform the Band Shuffle before our warm-up. This is the place where we play in a bit of an alcove, so it’s a tight squeeze for us. We will definitely have to adjust ourselves to fit (probably end up with more narrow rows). Please be aware that there is an extremely limited number of visitor parking spots on the property, but there is a sidewalk that runs from Litchfield Blvd (turn south onto Litchfield from Taylor) to the residence as a bit of a shortcut. Parking on Litchfield has traditionally been reasonably easy. It is a bit of a hike, so please allocate some extra transit time to account for the constitutional. Millennium Band (forest green) t-shirt and black lower body covering – this is preferred. Forest Green top, black lower body covering. It’s also the time of year where a trickle of binders are being turned in. Please make sure, before you turn in your binder, to put the music back in numerical order. This makes the Librarian’s job so much easier as he can go on autopilot when updating binders in the early spring. Repertoire planning is underway, but before I make any firm decisions, I need to have an idea of how our sections are looking up. The concert is on Saturday, September 8 (also the Banjo Bowl) and call time will be 7:30 pm to start playing at 8:00. Please let us know (through a comment below or at info@mbmillennium.com) if you CANNOT make this gig (or if you may be late arriving) as soon as possible! Next week is our concert! Please do your best to arrive at 6:30 pm so that we have time to do perform the Band Shuffle before our warm-up. The stage is wide and shallow, so we’ll probably have to go with two or three long rows as far as seating is concerned. Concordia Village is right across Molson from Concordia Hospital. I hope you’re all rested and recovered after Saturday’s shenanigans. It was a scorcher, weather-wise, but also, we were ON FIRE! We played really well, and every one of us should be proud of what we accomplished. You did well to preserve your chops – our second half sounded just as fresh as the first half. While the pieces weren’t as technically challenging as in the first half, they did require control, dynamically speaking. I’ve been on your case for years now about The Stripper. We are still not pulling back enough in order to make our crescendos successful. We end up getting louder – LOUDER – LOUDER. Not only is this hard on our chops, but it results in a less controlled sound. This happened on Saturday (we peaked too soon, then had nowhere to go for the piece’s climax). I have some ideas for this, which we’ll work on at our final rehearsal (I’ll program this piece for the Bourkevale gig – this will be a bit of an easier set list simply because we usually have some guests sitting in with us and it will be after a break in rehearsals). Yes, there were moments where we weren’t together, but we recovered from them really well – and that’s what our preparation is really about. Mistakes, miscounting, etc, are going to happen – there will never be a perfect performance. The key is in how we recover from them, and whether we can cover it up enough so that the audience doesn’t realise it. I think we’ve achieved that. This was one of our strongest Victoria Beach outings – I’m so proud of all of you. You put in an amazing effort! Many thanks to the Woolisons, for hosting us once again. I had a lovely time at the barbecue, and I hope that everyone who attended felt likewise. It was a great opportunity for me to watch and listen to you interact. I was really impressed because it looked a little bit like a family reunion – there seemed to be a lot of mingling, people were sharing from plates/coolers, etc. It really warmed the cockles of my heart to see those bonds outside of our playing. It’s easy to tell from our playing that we’re a team, but it was really nice to see that in action on the social side. So, now we’re on the home stretch. Rehearsal this week is in preparation for 2 concerts in a row: Wednesday, August 22 at Concordia Village, and Monday, August 27 at Shaftesbury. (Details will be sent under separate cover – one for each gig, but the program will be identical for both). I hope to see you all tomorrow! Our gig at Victoria Beach is on Saturday. I can hardly believe it! (I keep telling myself that it’s earlier this year, which is true). Most importantly, please take good care of yourselves. It’s supposed to be a scorcher, so sunscreen, bug repellent, HATS!!! (I bought mine today – it makes me feel like a movie star! ), lots of water are all necessities. (I usually bring a change of clothes for the barbecue – it helps me feel a little fresher). I really don’t want anyone to incur heat-related illnesses, so we all have to be vigilant of both ourselves and one another. It’s especially critical to drink a LOT more water than you think you need – even if you don’t feel thirsty. We all exhale water vapour with every breath – and this is especially true while playing. Most people talk about “spit” in brass instruments, but it’s almost entirely water vapour. I read about a study where they measured how much water came out of a trombone after a 2-hour rehearsal and it was something ridiculous, like over 1 LITRE. We will all need to make sure we’re drinking enough. Please, please, please keep a bottle or three beside your chair, and make sure you’re drinking while I’m addressing the audience! Even if you don’t think you need it, you probably do. Keep the dynamic level down – do not give in to the urge to overblow (which you will experience – playing outside rips the sound from the instruments so we can’t hear ourselves and think we need to play louder. We don’t). Bring things down an octave where you can. 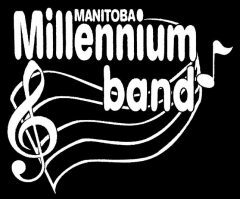 Concert dress is: Millennium Band t-shirts (or any forest green short-sleeve shirt. In a pinch, a black short-sleeved shirt) and black bottoms. This is not a formal concert – please feel free to wear shorts (or a skirt) and sandals. Really, it’s about keeping you as comfortable as possible in the heat while still identifying us as a group. The shuttle runs (from the parking lot to the bandstand) will begin at 1:00 pm. Please be at the bandstand, ready to settle (and perform the obligatory band shuffle) no later than 1:30 pm!!! It is possible that we will not be able to fit in the bandstand this year – we’ll try, but we may have to move to the grass, which take us some time to get organised. Make close friends with your neighbour, because we’ll have to cuddle up, regardless. Since we are playing outside, it’s going to be more critical than usual to watch me. We can’t trust our ears outside because of the way the sound travels. I will do my best to bring any balance concerns to your attention after the warm up, and as I’m able to throughout the concert. I’m certain that our pieces are not going to sound to you the way they normally do, but that doesn’t mean that the audience isn’t hearing things. After the performance, we’ll load up the shuttles and return our gear to our vehicles. We’ll then head over to The Woolisons’ cottage (I’m not posting their address online but I will announce it). If you have a folding chair, I would encourage you to bring it with you, or you may want to bring a blanket to sit on. (The Woolisons are amazing hosts, but I know they don’t have enough seating to accommodate all of us! We are a sort of invading horde). Cost for the meal is $5/person, payable to Dave Patrick (our treasurer-timpanist-mallet-whistle-insert more percussion titles here – extraordinaire). He usually does a walkaround to collect when we’ve mostly congregated at the cottage. I know I don’t have to mention it, but please, if you are able, help us out with loading/unloading the shuttles – especially the percussion equipment. (When it comes to percussion, please follow the directions of Dave, Bob, and Emily. They will let you know if any special care/handling is required. They are also Tetris champions of the world – it’s part of their job description). This may include waiting with gear at the parking lot for people to collect it – we don’t want lost instruments/belongings. If, at the end of the day, we have lost/found belongings, please let me know and I will send out a call in our next blog entry. (I will have a rehearsal plan for next week – since we’re playing on Saturday, I’ll post that on Sunday sometime). One final thought: have an absolute riot of a time on Saturday. This is a really fun gig (though a long blow). Let’s make the most of the fun part! You’re all completely prepared for this – I think it’s going to be one of our best performances ever, and I’m really excited what we’re bringing this year! This is the time of year when I begin looking forward to next year’s repertoire. (I’m not even joking. I’ve got one new score in mind for our challenge piece next year. Spoiler alert: it’s not by Robert Buckley). Here’s your chance to have your voice heard. If you have any suggestions (for brand-new pieces) or requests (from our existing repertoire – see the members page for two versions of our Library list), this is a good time to submit them for consideration. I can’t make any promises other than that I do take your preferences seriously. I also thought that you might, perhaps, appreciate a bit of a glimpse behind the curtain (such as it is) into the sorts of things I take into consideration when I’m planning repertoire, as well as when things need to be done in order for your binders to be ready to go when we start rehearsals. For the rest of the summer, I’ll be doing research (sporadically – this doesn’t consume my whole existence, but it is something I do at least a handful of times). Usually, by the time we’ve wrapped up for the summer, I know which two brand-spanking new pieces I think the band should acquire during the off-season. I will spend the fall listening to these pieces and still poking my nose about (in case I discover something interesting), but mostly just sitting with these choices and considering them in context with the rest of what I expect we’ll play. Basically, I’m puzzling out how all the pieces might fit for a strong season’s concert programme. By the time late February/early March rolls around, it’s time to get approval to make the purchases on behalf of the band. (I contact the Executive Committee and provide them with a rationale for the selections – what I think they’ll add to the band’s development and how they fit within our library – as well as listening links to help them determine for themselves whether they agree with my assessment. I usually have a back up plan in case they’re not thrilled about what I’ve proposed. That’s never actually happened). Once the choices have been approved, I place the order. Next comes the Librarian’s job. When he gets the scores, he copies all the parts so that the band has pristine originals in case something gets lost or we give away all the flute binders and we need music in a hurry. By early April, he needs the complete list of repertoire that I expect to draw from for the whole summer, because organizing the binders takes time. He monitors whether we need to make new copies, replace banged up binders, build new binders, etc. What he also does (that you may not realise) is optimise the layout of pages as best he can so your page turns are as easy as he can make them. (Seriously – if you have a nasty page turn, it’s the publisher’s fault. You librarian has given you the least bad option). level of difficulty – we should have one challenge piece (that we’re all learning together – even me) and one easier piece. That usually works out to a Grade 3 and a Grade 4 piece. (I also want to make sure that anything selected is something we should be able to master – I’m tough, but I want us to give awesome performances). instrumentation – I try to find pieces that feature multiple sections in prominent roles, and that don’t feature sections for long passages that we’ve historically had a tough time filling. the 2-year rule of thumb – I try (but don’t always succeed) to have a 2-year rotation. That means that we will likely play half our repertoire for two consecutive years, then give it a rest. For example, next year, you won’t see Bolero and Hallelujah (although Hallelujah will likely be one of our Hail Mary pieces – we’ll call on it if we’re in a pinch), and you can be guaranteed to see Arctic Fire, Moana, and Broadway Journey. other repertoire – This is where things get complicated. We need: easy pieces (for Victoria Beach and Bourkevale), at least one challenging piece to really sink out teeth into, things that seniors will love, things that children will love, at least one march, some slower music, contrasting tempos, a mix of art music (Classical, contemporary concert band) and pop music, Canadian content, music from different eras, music in different styles, etc. (Some pieces do check off multiple boxes: Arctic Fire is challenging, art music, and Canadian). Because we are such a diverse group – we have some pretty new musicians right on through some seasoned ones – I have to examine my crystal ball (which doesn’t have a better warranty that your own) and imagine all possible scenarios for our make up in the summer. What happens if we have all newer players? Well, we need enough easier music so that they feel comfortable performing and we can play a double set at Victoria Beach. What about if we have no trumpets? I have to get my scores out and do some serious analysis to reassign those parts. How about if we have really experienced players? I need to have enough challenging music available that they feel they’re working. We have a unique ensemble for a number of reasons: short rehearsal season, disparate playing levels, variable attendance, wide variation of audiences. These factors all have to be evaluated when it comes to choosing repertoire. If you have in your possession a score that you would like us to read, please feel free to contact our Librarian (info@mbmillenniumband.com is the best way) and he’ll make arrangements with you to work it into our sight-reading schedule. On a final note, we resume our regular rehearsals on Wednesday, August 8. I hope everyone has had an enjoyable break, and I look forward to our reunion on Wednesday!